If your in the mood for Pizza and great cuisine, check out Giuseppe Pizzeria because they offers excellent authentic Italian cuisine. But Italian cuisine is more besides pizza and pasta. For example: The special Sicilian food renowned for its seafood, but meat dishes are also central to its food culture. Many are traditionally made with lamb or chicken. Also to mention the Sicilian sweets and ice cream. The restaurant is located 1km from the famous Alona Beach, its along the highway so you can’t missed it. They are known for serving fresh and high quality ingredients. Italian style restaurant with the best pizza I had in The Philippines, and really cold beer. The pizzas are big so you won't leave here hungry if that's what you order. Also tried some pasta which was very good. The staff were very attentive and service minded. I'ts a little bit off the main area, but within walking distance, and well worth seeking out. The only negative thing was that we only discovered this place at the end of our stay. Would have loved to try some of their other dishes. Definitely a must visit when you’re in Bohol! Amazing, amazing Italian food! The staff are warm and friendly. Food is superb and served just after the right wait time. Wine selection is excellent and to top it all, it doesn’t have tourist-turn off pricing. Say Ciao in Panglao! So good we have found this place here. 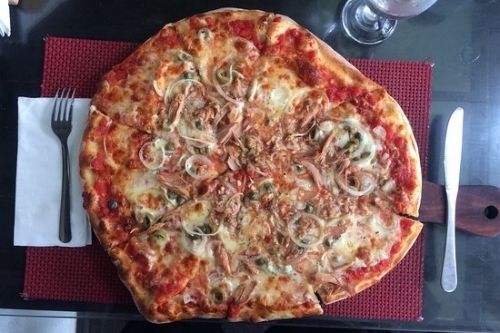 If you miss some good pizza, you should choose Guiseppe pizzeria and go for a seafood or meat pizza. Tastes just perfect (with sambuca as aperitif;))!